Today it's a Nature Conservancy refuge, a popular place for birders to observe migrating and resident birds across 200 acres of marsh, grassland and beaches on a key point in the Atlantic flyway. Who would have guessed that 130 years ago, it was home to an elephant? To be fair, the Jersey shore was once home to two elephants, and both, while bigger than life, were man-made. The still-surviving Lucy stands between apartments and retail establishments on Atlantic Avenue in Margate. The South Cape May elephant, however, perished at the relatively young age of 16, the victim of a bad business plan. The mid to late 1800s was a busy time for developers along the Jersey shore. Entrepreneurs were grabbing up as much waterfront property as they could, with visions of selling lots and building entire communities. Some like Alexander Whilldin saw opportunities to extend their personal ideals, while others were purely in it for the financial gain. Among the latter was Theodore Reger, who, with partners, formed the Cape May City Land Company to purchase 225 acres just south of an already-popular vacation haven. To advertise the resort community they envisioned there, Reger and his partners took a page from James Lafferty, who'd already used Lucy to draw buyers to a similar settlement about 40 miles up the shore in Margate. 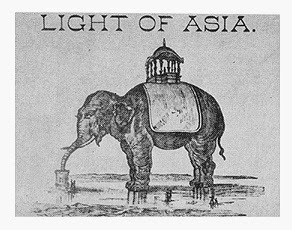 They bought the rights to erect a 58 foot high elephant which they called the Light of Asia, fully expecting lightning to strike twice. More than 13,000 square feet of tin was used to sheathe the wooden elephant, covering about a million pieces of wood, 250 kegs of nails and six tons of bolts. She was completed and opened for business in 1884. For a ten cent admission, visitors could get an expansive view of the ocean and surrounding beachfront from the Light's howdah, or seating platform, perched on the elephant's back 40 feet above the sand. If a zoning board had to classify the Light of Asia, they might have an interesting time of it. While the howdah was a sightseeing platform, the belly of the beast was intended to hold a concession stand. Reger used another part of the structure for a real estate office. When the Cape May City company failed, he and his partners incorporated two successor ventures, the Neptune and Mount Vernon Land Companies, the latter of which was the final owner of the elephant. Things didn't turn out as well for Reger and his partners as they did for Lafferty. First off, while the Light of Asia was an inspiring name, folks came to call the elephant Jumbo, after P.T. Barnum's popular beast. And though sightseers flocked to take in the sight of the beach-dwelling pachyderm, the number of people who paid admission to climb its legs to the platform was far below what Reger's group had anticipated. It seems that if they had any mind to get a high-up view of the area, people preferred to climb the Cape May Lighthouse for free. Unsuccesful as a venture, the Light of Asia became a billboard for one of Reger's other local businesses, the New Mount Vernon Hotel. Meanwhile, vagrants moved into the elephant as it became increasingly more dilapidated. It was finally torn down in 1900. A few buyers were convinced to settle in the vicinity, enough to incorporate as the town of South Cape May, but the town's history was brief as large swaths were lost to erosion and major storms in 1944 and 1950, Finally, what was left became a grazing pasture and then was converted to fresh water wetlands as the Nature Conservancy's South Cape May Meadows, host to migrating birds and resident species alike. There's no knowing whether the Light of Asia would have withstood the storms (though I doubt she would have fared very well), but I'm rather tickled by the idea of a larger-than-life elephant standing amid marsh grass and dunes. Ol' Jumbo might have been a pretty neat hawk watch platform. Standing on the beach at the very tip of New Jersey during our most recent birding jaunt, my mind went back to a curious story I’d heard a while back. The quiet residential area just off the beach had once been much larger, but about a quarter of it had been wiped away, victim to erosion and a series of storms. The Jersey shore is no stranger to destruction, as anyone who survived Hurricane Sandy can tell you. The 2012 storm was nowhere near the first round where man’s work was KO’ed by Mother Nature. As I discovered, though, the Cape May environs has gotten nailed more than a couple of times, erasing large swaths of beach developments from the map. In fact, the very stretch of sand where we scanning gulls and terns had actually been a street called, ironically enough, Beach Avenue and the riprap jetties poking from the sand into the ocean are built essentially on what were once the cross streets. This was the southernmost portion of the town of Sea Grove, one of the many religious-themed communities founded in the years following the Civil War. Unlike Mount Tabor, Pitman Grove and Malaga, however, it wasn’t created by Methodists, nor did it come close in popularity. Philadelphia cotton merchant and devout Presbyterian Alexander Whilldin originally secured ownership of the area, once known as Stites Beach, through marriage; his wife Jane's family had bought the land in 1712 through the West Jersey Proprietors. After first incorporating the West Cape May Land Company in 1872, he joined forces with retailer John Wanamaker and a group of real estate speculators three years later to create the Sea Grove Association, which purchased 266 acres from Whilldin for five dollars. The association’s goal, as stated in its bylaws, was to “furnish a moral and religious seaside home for the Glory of God and the welfare of man, where he may be refreshed and invigorated, body and soul, and better fitted for the highest and noblest duties of life." Sea Grove directors claimed that while the typical seaside resort of the day focused on "lavish display, extravagant living... and consequent expense to be regretted when the apparent pleasure is past," visitors at their community would experience "good living." The temperance-minded organization forbade both alcohol and amusements, envisioning a quiet community unlike the much busier Cape May City a few miles to the north. Taking a page from Pitman Grove, Philadelphia architect J.C. Sidney arranged the town’s main streets to radiate from a central hub, on which an 15,000 seat octagonal worship pavilion would be built. A separate corporation was founded to build houses and hotels, offering ministers $500 lots to encourage them to settle in the town. And to make it easier for potential residents to get to the remote community, the Association promised a free West Jersey Railroad pass to Cape May City for everyone who built a cottage in Sea Grove, and built an additional horse-drawn passenger train to ease the final leg from the station to their new summer home. Visitors and summer residents were welcomed to the community by an ornate gate that was meant to resemble the gates of heaven. 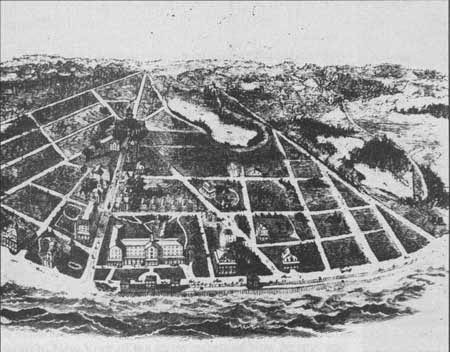 A 1876 "bird's eye" view of Sea Grove. To accommodate those who didn't want to purchase property, the Association built the Sea Grove House overlooking the shore. Small shops opened to serve the community’s needs, given the distance into Cape May City. The Sea Grove Association quickly sold out its 275 residential lots, but its salad days were few. Troubles started surfacing as early as 1879, even as other religious communities around the state were thriving. What’s for sure is that the investors took a bath. While the entire project had cost somewhere in the neighborhood of half a million dollars, the property, including the pavilion and boarding house, were sold for just $120,000 in 1881. The pavilion was removed in 1881, its wood sold as salvage, leaving a field that’s still largely empty. The Sea Grove House had a slightly more positive fate, operating as the Carlton Hotel until 1910. Following the failure of the Sea Grove Association, the community incorporated as the Borough of Cape May Point. The intervening years brought a series of storms that severely eroded the area south of Cape May City, virtually destroying South Cape May (a story for another time) and engulfing the Point's Beach Avenue and several intersecting blocks. Today, the community holds about 600 seasonal and year-round homes. It’s still a quiet place, with no boardwalk, no liquor stores or bars, and no motels. Its two retail businesses say a lot about the community’s attractions: a general store, and the gift shop at New Jersey Audubon’s Cape May Bird Observatory. And a quick glance at the part of town nearest the beach betrays none of the devastation of surf and storm. The streets that lost length to the sea have been squared off with their cross streets, creating elbows where there were once four-way intersections, with dunes piled up as protection. It's seemingly only St. Mary's By the Sea, a resort turned Catholic retreat center, that appears poised to be taken away with the next big wave. One can imagine the Sisters pray nightly for reprieve. Some people will travel hundreds, if not thousands of miles to visit the same spot every year. Ask the many Canadian families who migrate to Wildwood every year for their sun-and-fun vacation, a ritual that has by now spanned generations. Birds, apparently, can be of similar mind, or at least we can imagine that to be the case from the story of the Whiskered tern. The species, normally seen only in Europe, Asia, Africa and Australia, has shown up in North America only three times, all within the past 21 years. Every time, it's been seen in Cape May. Yup -- of all of the places a seabird can decide to set down in the entirety of the continent, New Jersey has been its first choice in 1993, 1998 and again this year. (In the interest of full disclosure, one was seen in Delaware for a month after the second New Jersey sighting, but it's presumed to be the same bird.) It's not exactly the annual Wildwood trip, and it most certainly hasn't been the same individual bird all three times, but Garden State birders do appreciate the loyalty, spotty as it has been. A crowd usually forms when a rarity is sighted in Cape May. This year's Whiskered tern was first sighted at Cape May Point State Park on September 12, at the bunker pond not far from the annual Hawk Watch platform. Unfortunately, Ivan and I couldn't make the trip until today, but continued reports of the bird's presence kept us hopeful it would wait around for us. The worst case would be if we made the trek only to discover we'd just missed it by a whisker. Last night's birding reports were that the bird had been seen at the bunker pond. We were barely out of the car at the State Park when a fellow birder told us the tern was farther down the beach, near Coral Avenue. Say no more. We buckled back up and made the quick trip a few blocks. The presence of cars from as close as Pennsylvania and as far away as West Virginia both told us we were in the right place and confirmed what a big deal this bird was. We traversed up a set of stairs over a dune and down to the beach, passing a viewing platform where a large group of binoculared folks was scanning the sand. Sure enough, the bird had left about ten minutes before we arrived. Had we not stopped for a quick Wawa breakfast, we'd have seen it. Another birder reported that the bird habitually stuck around the beach in the mornings. If we were willing to hang out and periodically scan the standing flocks of gulls and more local terns on the beach, we'd probably see the Whiskered tern eventually. That seemed fair enough. Scores of gulls and terns were out over the ocean a hundred yards or so from the beach, occasionally diving down to grab a fish breakfast. They'd have to set down sometime. Obviously this was the right place to be, provided our target bird hadn't already eaten his fill for the morning. Looking through piles of gulls and nearly identical terns for something different can be a bit frustrating this time of year. We knew we were looking for a bird with a broad black cap and a gray body that would differentiate it from other terns, but light and nature can play tricks on your eyes. Plumage evolves into the fall and winter months as it turns from breeding colors to bland for many species. To make matters even more challenging for me, the Whiskered tern isn't listed in North American guides, and we hadn't printed pictures from the web. As we waited for our guest to show, we had a nice but puzzling surprise: a trio of Surf scoters swimming nearby. These guys normally spend their summers breeding in the upper reaches of Canada. Were they just early arrivals for their normal New Jersey winter, or, odd as it might seem, had they just never left here in the spring? in the center of this digiscoped photo. That question still in the air, we saw the platform birders had migrated to the beach and one of them was pointing toward a group of birds milling around in the sand. Scanning the impromptu flock, we found it pretty easily -- it was standing in full view, the only tern with a light gray breast. The poor guy looked a little lonely and downcast, as if he realized how different he was from the others around him. Sure, we were anthropomorphizing, but I had to wonder if maybe his European or Asian accent had set him apart unfavorably among the rest of the terns. Or maybe he was just missing the Black tern that's been seen with him several times. Or maybe he was just resting. In any case, we were thrilled to have gotten to Cape May before the Whiskered tern made his leave for wherever he decides to go next. Why he's in New Jersey has yet to be determined (if ever), but he's definitely made friends. It was a new life bird and new state bird for both Ivan and me, a double feat that's become increasingly rarer for us. Still, we wondered: why is it called a Whiskered tern? We didn't notice any hint of whiskers, or even a five o'clock shadow. Perhaps the name was given for something that can only be seen with the bird "in hand," as ornithologists will say about a specimen taken for research purposes. Or maybe it's just one of those odd names. Any ideas, birders? Wander around the exhibits in the removed and restored Indian Queen Tavern at East Jersey Olde Towne, and you'll find reference to several comparable inns and taverns that once accommodated steamboat travelers. Not surprisingly, New Brunswick was a busy place, with travelers transferring from boats to the overland stagecoach across the state on their way to Philadelphia, Washington or any number of other points beyond. Among the many names mentioned in the Indian Queen's exhibits, I was surprised to see a very familiar one: Vanderbilt. Vanderbilt? As in Commodore Cornelius Vanderbilt? I knew he'd been born on Staten Island and that the family was involved in the early days of the ferry system between there and Manhattan, but I had no idea their influence extended along the Raritan River. Indeed, an article in the February 8, 1901 issue of the San Francisco Call declared that the Bellona Hotel in New Brunswick was the origin of the Vanderbilt fortune. 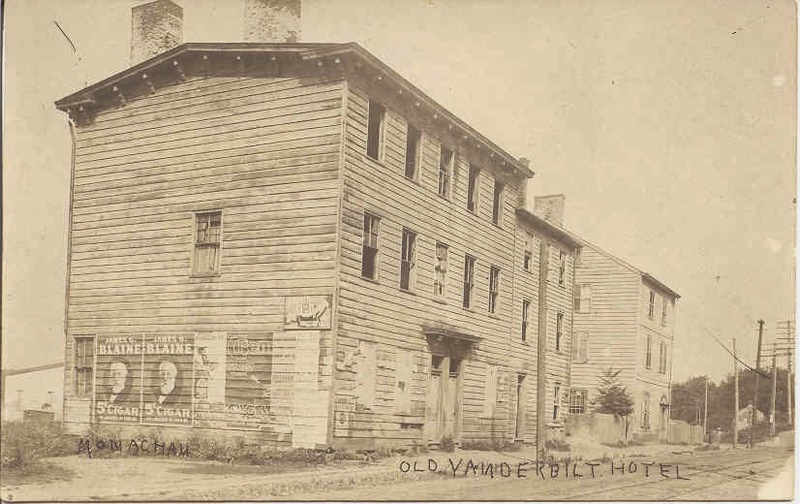 Vanderbilt's Bellona Hotel, well after the family had sold it. Courtesy New Brunswick Free Public Library. It makes sense when viewed in context. By the early 1800s the growing city was becoming a viable shipping port, both for freight (as we saw from Raritan Landing) and for the increasing numbers of people traveling and simply seeking a pleasurable excursion. William Gibbons' New York and New Brunswick Freight Company ran freight and passenger sloops between the two cities in direct competition with Robert Fulton and Robert Livingston. Vanderbilt had followed his father into the ferry business in 1810, starting his own company at the age of 16. The ensuing years were important ones for the budding mogul: first he married his cousin Sophia Johnson, and then he met Gibbons, who was determined to break the Fulton/Livingston monopoly. Having heard several accounts of Vanderbilt's feats as a boat captain, Gibbons believed he'd found his secret weapon. Seeing the opportunity to learn from one of the wealthiest and most successful businessman of the time, Vanderbilt agreed to work for Gibbons, even though it meant a cut in pay. Included in the deal was Halfway House, a ramshackle tavern on Burnet Street, near the river. Gibbons expected the Vanderbilts to get it back in habitable shape and run it as an inn, returning 20 percent of the revenue to him. It would also be their home. The couple divided the labor: Cornelius handling the boating while Sophia ran the lodging. She named the inn Bellona Hall (or Bellona Hotel, depending on the source), after one of the company boats, and it soon became an attraction drawing patrons from New York. President John Quincy Adams even stayed there for an evening in 1826 while traveling from Philadelphia. Sophia proved to be a supremely able innkeeper, managing all aspects of the Bellona through the birth and raising of 13 children. In addition to cooking, cleaning and entertaining guests, she kept the books and negotiated with wholesalers for the best prices on food, liquor and other supplies. Over the 12 years the Vanderbilts were in New Brunswick, Sophia made a handsome profit, all the more necessary because Cornelius refused to contribute toward the household expenses. Reportedly, she even lent her husband a substantial sum to buy controlling interest in a steamboat. It's not quite clear exactly when the family left New Brunswick, but it's probably safe to say that it was probably around the time Vanderbilt left the steamboat business in favor of the railroads. With the advent of the Camden and Amboy Railroad and the Delaware and Raritan Canal, New Brunswick's prospects were clearly no longer with the Vanderbilts. The building itself seems to have fallen into less able hands over time. Some reports labeled it a tenement. A 1908 New York Times article on the sale of the property for $15 and an equal amount of back taxes noted that "In late years the hotel has been used as a boarding house for foreigners." By 1913, the building was razed and replaced with a slaughterhouse. There's some question about the exact location of the Bellonia, but it's most likely somewhere under the pavement of State Route 18, or maybe somewhere in Boyd Park. Save for Rutgers and a few churches, New Brunswick was notoriously bad about preserving its past, and all vestiges of the old docks and wharf area have been obliterated either by the highway or the redevelopment of the past 35 or 40 years. It's a shame, really. With the proper focus and care, the city's nautical past might have been a big draw for 20th and 21st century visitors. If you look through the trees along the northbound side of the Garden State Parkway northbound, just before exit 136, you might notice an enclave of small dwellings, many connected to each other. These nicely kept one- and two-story buildings look a bit like modular housing, yet there's an air of permanence to the entire area. You've just passed the town of Winfield, a proud enclave of just under 1500 people on a triangular 0.177 square miles of land bordered on two sides by the Rahway River. It's basically a sliver of land between Cranford, Linden and Clark, so small there are only two roads in and out of town. Many in Union County know it as a tight community where generations of families have lived in what was originally built as temporary defense worker housing during World War II. That's partially true: residents have always been close-knit, and the town was built for defense workers, but the houses were always intended to be permanent. And Winfield holds a unique distinction among American towns: it's the only defense housing project to be established as a separate municipality. Winfield has its roots in the months before America entered World War II. The U.S. Government's Federal Works Agency had created the Mutual Ownership Defense Housing Division to build suitable dwellings for the multitudes of workers who were being hired by manufacturers and shipbuilders supplying the armed forces and America's allies. The low-cost, permanent housing would be a boon for people who lacked enough money for a down payment: the government planned to sell the developments to their resident-owned and operated housing corporations. Need for housing was particularly acute for employees at the Federal Shipbuilding and Drydock Company on Kearny Point, and the FWA set to work to find a large enough piece of land on which to build 700 housing units. Another 300 were built in nearby Newark and Harrison. Actually locating the development wasn't easy, for both logistical and political reasons. The ideal location would be close to utility networks but in a community where those facilities were underused and land was inexpensive. Open tracts in and immediately around Kearny were largely marsh and easily ruled out as too difficult to develop quickly, forcing the FWA to look farther afield. Ultimately, they investigated seven different communities as possible locations. Nearly 20 miles away, a small bit of land by the Rahway River in Clark looked ideal. Then the political challenges emerged. While Clark officials had courted the project, their constituents were concerned that the influx of new residents would change the town's character. Taxes were anticipated to double as the cost of services would increase while no new rateables would be built with the community. The issue became so contentious that the entire slate of officials who'd encouraged the project were voted out. With local government now led by sympathetic officials, opposition leaders then came up with a plan to ensure the defense worker community would have no impact on the town's finances. If they couldn't stop the project, they'd find a way to get it declared an independent town with its own budget, taxes, services and public works obligations. That's exactly what happened. Just after construction began on the project in June 1941, one of Union County's state assemblymen introduced a bill to establish Winfield Park as a municipality. Through legislative sleight-of-hand, the bill was rushed through both houses without opportunity for discussion or public comment. Governor Charles Edison refused to sign it into law, declaring it to be counter to the needs of national defense, but his veto was easily overturned. For better or worse, Winfield Park was now a municipality -- the only one in New Jersey owned lock, stock and barrel by Uncle Sam. Opponents inadvertently helped create a sense of camaraderie and self-determination among Winfield residents, starting when the first pioneering 145 families moved into the incomplete town in November 1941. What they found when they arrived was less than ideal -- shoddily built homes with inconceivably poor plumbing, muddy roads and sidewalks, and no electricity -- but they made do. After residents went on a rent strike to underscore their grievances, Federal investigators found the contractor guilty of fraud and bid manipulation, forcing the FWA to hire a new company to finish the project. Still, Winfield Park residents soldiered on, creating a town from scratch. Defense workers headed to work on a government-supplied bus (when it wasn't broken down) as their families got to know each other. Friendships grew and clubs formed, along with a volunteer ambulance squad and co-op grocery store. A grammar school opened to much fanfare in 1943. And as was originally envisioned, the Winfield Park Mutual Housing Corporation purchased the entire town from the U.S. government in 1950, paying off the mortgage in 1984. Inevitably, with the arrival of the Garden State Parkway and greater suburbanization, the land on which Winfield sits became more valuable than the homes and small commercial area sitting on it. Though developers have periodically approached community leaders with various proposals for redeveloping the area, the residents have always said no. It appears that they like where they live and who they live with. Why change it now? Over the weekend, we made another visit to East Jersey Olde Towne, a collection of historic buildings moved to Middlesex County's Johnson Park when threatened with destruction. This time around, the buildings were open and we arrived just in time for the afternoon tour. The buildings themselves are interesting examples of colonial-era architecture, with ties to the area's original settlers and their descendants. The really fascinating part of the tour, however, wasn't the structures or their former owners, but of another town whose remnants remained hidden below the grounds around us. A hint of its existence is in the name of the Landing Lane Bridge, which crosses the Raritan River near the borders where New Brunswick, Franklin Township and Piscataway meet. The name always seemed a little odd to me, but it suddenly made sense when I learned the name of the hidden community: Raritan Landing. True to its name, Raritan Landing was a busy port community starting in the early to mid-1700s. The sons of New York merchants, eager to strike their own fortunes, realized that there was money to be had in the productive lands of the Raritan Valley, if they could get the bounty to the city. Farmers had plenty of grain, timber and livestock to sell, and the growing city populations had a large appetite and shrinking amounts of available land on which to farm. Shipping by boat would be the fastest and most productive route, leading them to set up shop on the farthest inland point of navigation on the Raritan River. Warehouses started popping up on the northern banks of the Raritan River, west of New Brunswick as farmers learned of the new opportunity to sell their crops. It's said that 50 or more wagons at a time would be lined up on the Great Road Up Raritan (now River Road), waiting for their opportunity to unload their wares. A small but dense community grew around the commerce with residents building houses, stores, stables and a mill, among other structures. Land along the Raritan is low, and Johnson Park floods in a decent-sized storm, as we've seen with Hurricanes Floyd, Sandy and Irene. Raritan Landing was a good three feet lower than the land is today, and residents found themselves flooded out time and time again. Wealthy merchants retreated to the bluffs above, building stately houses befitting their success. Today, the stone Cornelius Low mansion stands near the corner of Landing Lane and River Road, the only visible sign of the community that once bustled below. So why did Raritan Landing disappear? Its demise came in stages. First, the Revolutionary War brought raids from foraging British and Hessians who first looted property and then burned buildings down, driving many residents away in the process. Some locals returned, but many sold their lots to wealthier merchants, changing the character of the community in the process. In the 1830s, newer, faster transportation came to the area in the forms of the Delaware and Raritan Canal and the Camden and Amboy Railroad, enabling farmers and merchants to get their goods to market faster. 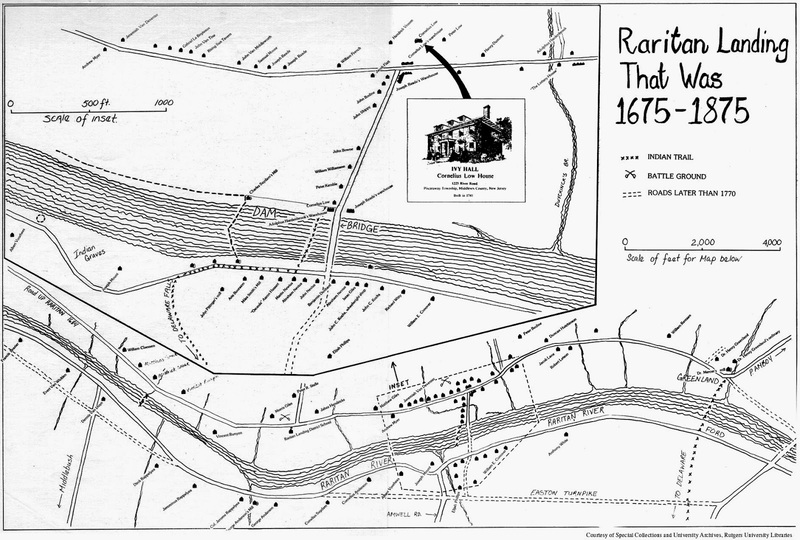 Raritan Landing essentially became obsolete. By 1870, many of the buildings had been dismantled, the land converted to pasture. Sixty years later, visible traces of the village were obliterated, covered by three feet of fill dumped there when land across River Road was excavated for the construction of Rutgers Stadium. Fortunately, local historian Cornelius Vermeule created a map of Raritan Landing based on his own childhood recollections and stories garnered from family members. Ironically, much of what we know about Raritan Landing comes thanks to sewer enhancements in the 1970's and road-widening projects of the late 90's and early 2000's. The New Jersey Department of Transportation was required to underake an archaeological survey before building the Route 18 extension into Piscataway, resulting in the unearthing of several building foundations and a treasure trove of 18th and 19th century artifacts. Luck played a role in the project, too. Archaeologists were about to walk away empty-handed in the 70's when a local resident came by to ask what they were up to. He recalled the mounds of excavated dirt dumped near the river bank from the stadium construction, leading the researchers to dig much deeper for their quarry. Several of the more interesting artifacts from the digs are on display at East Jersey Olde Towne, but frustratingly, DOT archaeologists unearthed only a portion of what remains of Raritan Landing. The state was only required to investigate areas that would be disturbed by road construction, leaving much more of the old village below the surface. Even the foundations they discovered are now invisible to the eye, having been covered over again. Some might have even been paved over. The thing is, it's still there, waiting for future generations to find it. Who knows when it will be unearthed, or by whom. We can only hope that if our descendants choose to build more road there, they'll care enough to dig for the treasure of our shared past. Is there a doctor in the dugout? The baseball prowess of Doc Cramer. Drive Route 72 through Manahawkin, and you're likely to ask the same question Ivan and I did: who's Doc Cramer? His name appears on directional signs, and if you wander off the highway a touch, you'll find Doc Cramer Fields, a municipal sports complex. The first time we noticed the sign, it was dusk and we were on our way to the Road to Nowhere to find owls. Our imaginations went to the days when Ocean County was sparsely populated and, perhaps, home to a kindly general practitioner who might have been popular enough to warrant having a street named for him. You know: ol' Doc Cramer, who delivered most of the kids in town and tended to Mrs. Smith's lumbago. My mind transformed him into Burt Lancaster playing Dr. Archibald "Moonlight" Graham in Field of Dreams: a man who gave up dreams of baseball stardom to go to medical school and care for an entire small town. Sometimes those odd mental linkages have merit. When we got back to Hidden New Jersey headquarters, I discovered that Doc Cramer was, in fact, a baseball player, and quite a good one, too. Born in Beach Haven in July 1905, Roger Cramer was never a doctor or a medical student, despite earning excellent grades in high school. Rather, he kind of did the Moonlight Graham routine in reverse. As a boy, he often accompanied local doctor Joshua Hilliard on house calls around Manahawkin, picking up his lifelong nickname along the way. Though he'd been playing ball since the age of eight and starred on his high school team, Cramer's entry into professional ball was late by most standards. He was 24 and playing on a local semi-pro team when Philadelphia Athletics backup catcher Cy Perkins saw him. At Perkins' suggestion, Cramer tried out for the A's the next day and was sent to their D-league minors team. After some seasoning, Cramer joined the A's as a utility outfielder in 1930, getting even more playing time in the following years and playing in the 1931 World Series. He became known for his prowess at the plate, going six for six in a nine-inning game and setting a franchise record that still stands today for season hits by a left-hander. Despite his solid hitting, his contract was sold to the Boston Red Sox as A's team owner Connie Mack faced Depression-era financial woes. 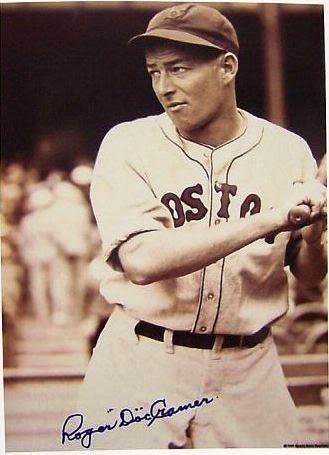 Cramer's success continued during his six year stint in Boston, as he hit over .300 every season from 1937 to 1940, tying the league lead in hits in that final year. He played one season on the Washington Senators and spent another seven years in Detroit before concluding his 19 year career. In total, he played on three All-Star teams, appeared in two World Series and retired with a .296 batting average, among his other achievements. While Cramer's statistics could arguably put him into the Hall of Fame, he's yet to be enshrined in Cooperstown. Some say that his case is weakened by the fact he played during World War II, when Major League rosters were depleted of their talent. Ironically, as a coach for the Chicago White Sox, he was instrumental in developing future Hall of Famer Nellie Fox, whose career numbers are remarkably like Cramer's own. Cramer played long before athletes were paid large salaries -- most if not all had to keep off-season jobs to make a decent living. Workman's tools replaced the bat and glove in the fall and winter months as he built houses as a union carpenter. According to the Society for American Baseball Research, he made more money swinging a hammer than he ever did on the ballfield. Staying true to the Jersey Shore, Cramer lived in Manahawkin for much of his life and returned to the house he built there when he retired from baseball for good in 1953. According to family and friends, he still responded to fan mail from admirers and often hosted his old baseball teammates, even getting to Philadelphia from time to time for a Phillies game. Cramer died in 1990 after a brief battle with cancer. He's buried at Greenwood Cemetery in Cedar Run, and honored, of course, by the street and ballpark that carry his name. Long-time readers know we have a special relationship with Ellis Island... the New Jersey side. As a volunteer with the National Park Service partner non-profit Save Ellis Island, I tell the little-known story of the immigrant hospital that once treated and cured over a million people in the first half of the 20th century. I've explored portions of the 29-building unrestored hospital complex, but I haven't been able to share that much with you because, well, it hasn't been open to the public. Why share something hidden that you can't go to see for yourself? 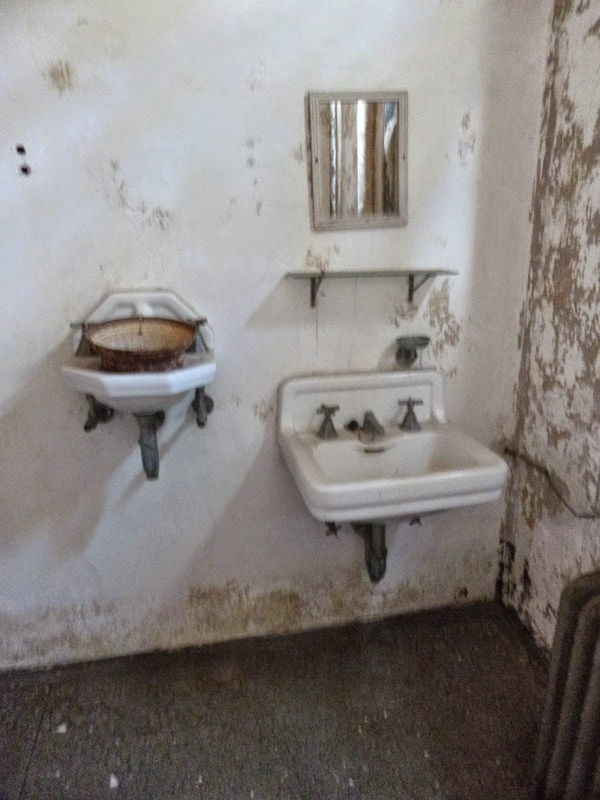 Starting on October 1, Save Ellis Island will be conducting reservation-only hard hat tours of the island's south side, including several sites within the historic Public Health Service hospital. Visitors will see rooms where doctors worked to cure immigrants of illnesses ranging from measles to the infectious eye disease trachoma. While there's very little furniture left in the wards, the walls and windows tell a compelling story, reminding us how hard it must have been for sick immigrants to have their American dreams delayed by illness. The hospital was a city unto itself, and the tour will reflect that. More than a million people were treated there, with mortality of only 3500 souls. The morgue and autopsy room will be on the tour, as well as the laundry that cleaned and sanitized up to 3000 pieces of linen a day (imagine the cool machinery involved with that!). You'll also get to see the large (but yet to be fully restored) lawn and recreation space where recuperating patients enjoyed fresh air, sunshine and a breathtaking view of lower Manhattan. Befitting the hospital's unrestored state, this is a program for folks who are comfortable with uneven surfaces, dust and peeling paint. The buildings are safe, but they definitely won't pass the white glove test. If the prospect of getting into buildings that haven't been open for 60 years isn't cool enough, tour participants will be getting an extra treat: a really unique (and hidden!) art exhibit. The artist JR is in the process of installing a project that repopulates the hospital with some of the immigrants who traveled through Ellis. I had the opportunity to check out a few of the areas he's already worked on, finding hope, poignancy and whimsy mixed among more than a dozen life-sized historic photos installed on the walls, windows and fixtures. Revenue from the ticket sales for the tours will support SEI's ongoing restoration and preservation work on the hospital buildings. As you can imagine, bringing more than two dozen century-old buildings back to life isn't a quick or inexpensive task. Keep an eye on our Facebook page and the Save Ellis Island web page for details on reserving your spot on an upcoming tour. Who knows -- I may even end up being your guide!